This 43 years old male was seen at the out patient clinic because of Rt. flank pain and gross hematuria. On an intravenous pyelograma, a smooth large filling defect was noted in the middle ureter accompanied by moderate hydroureter. 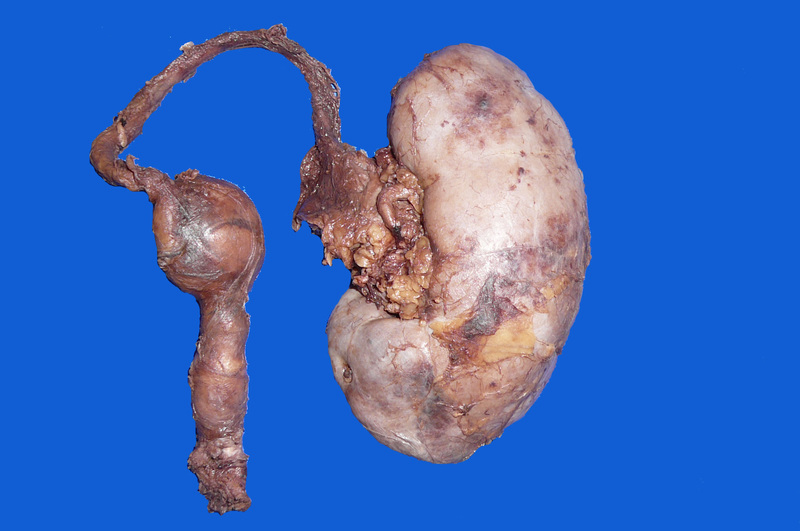 The renal pelvis was unremarkable. A total nephroureterectomy was done. 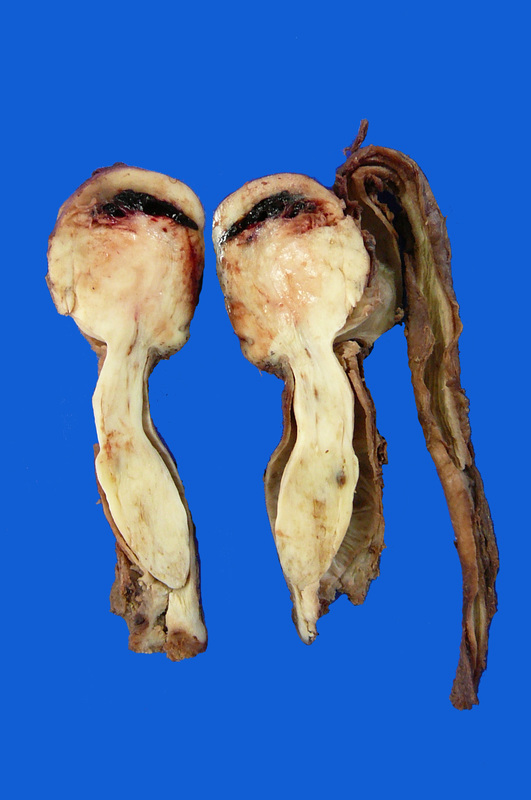 A large drum-stick shaped tumor is located in the ureter. On opening the ureter, a large, elongated, white, solid tumor fills the entire ureteral lumen and is attached to its wall (Figs. 1, 2, 3). Microscopic examination disclosed a spindle cell proliferation with cells of blunted, regular nuclei and an eosinophilic, fibrilar cytoplasm (Figs. 4, 5). No mitosis or necrotic foci were seen. There is a strong cytoplasmic immunoreactivity for actin (Fig. 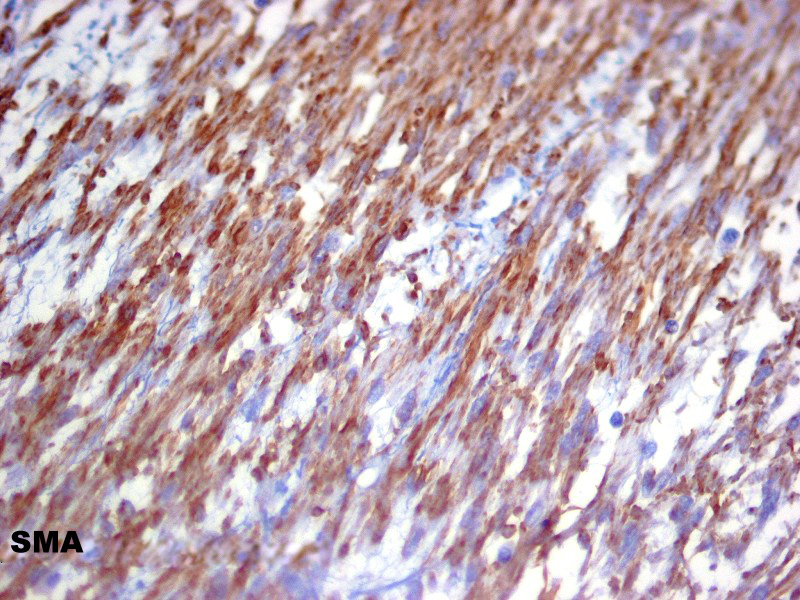 6) and for specific smooth muscle actin (Fig. 7). S100 and CD34 are negative. Primary ureteral tumors are rare, and account for only 1% of all upper genitourinary tract neoplasms. Benign ureteral lesions are even rarer representing approximately 20% of all ureteral tumors (1). Non epithelial benign mesodermal tumors are the rarest comprising less than 3% of all primary tumors of the ureter. 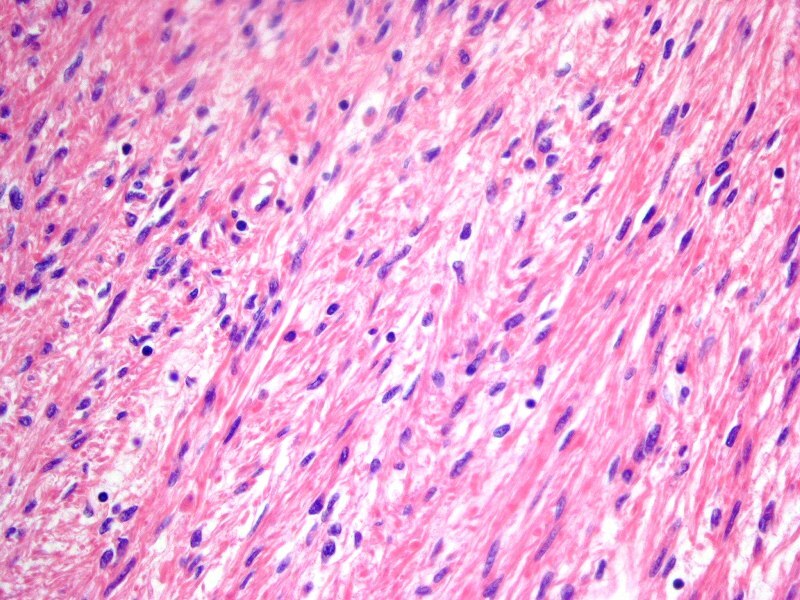 With the exception of the combined epithelial –fibrous tumors named fibroepithelial polyps that are frecuently found (2), only occasional examples of solitary neurofibroma (3) or in association with Von Recklinghausen neurofibromatosis are in the literature (4). 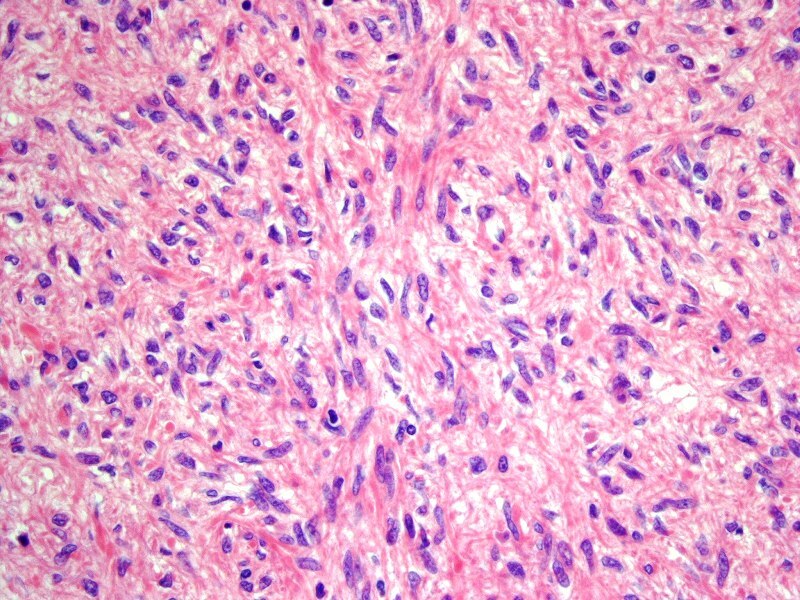 Sporadic cases of primary hemangiomas are also recorded (5,6). Primary leiomyomas of the ureter are uncommon and only 12 cases have been reported since the first case reported by Leighton in 1955 (7-18). The age of the patients ranges from the 4th to the 5th decades of life. Only two cases are reported in children (9-16). The male gender is predominant 2:1. 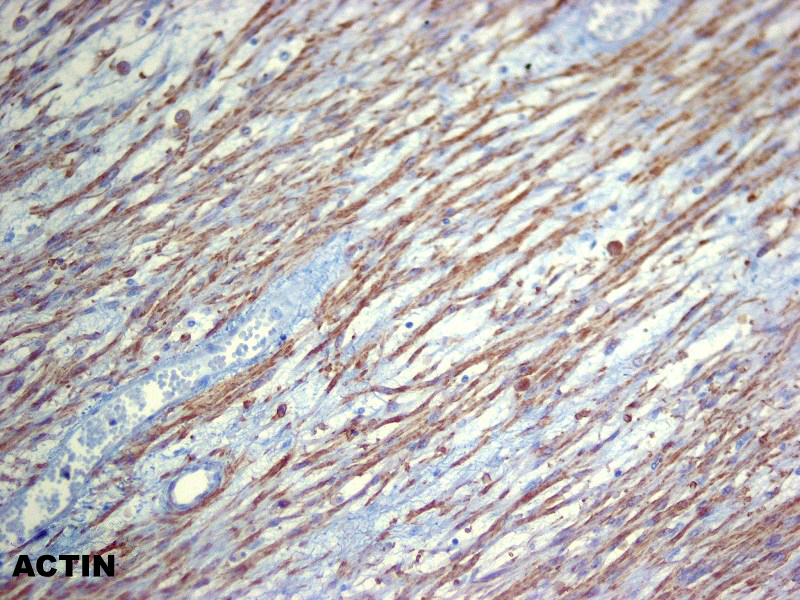 One case is associated with multiple endocrine neoplasia Type 1 (15). Hydroureter, hydronephrosis, flank pain with hematuria, ureterocele and blood clot retention are the predominant symptomatology (10,14). Most tumors are located within the ureteral lumen in continuity with the muscle wall without extention to the renal pelvis. Varela-Duran J, Urdiales-Viedma M, Taboada-Blanco F, Cuevas C. Neurofibroma of the ureter. J Urol 1987; 138:1425-1426. Sekar N, Nagrani B, Yadov RVS. 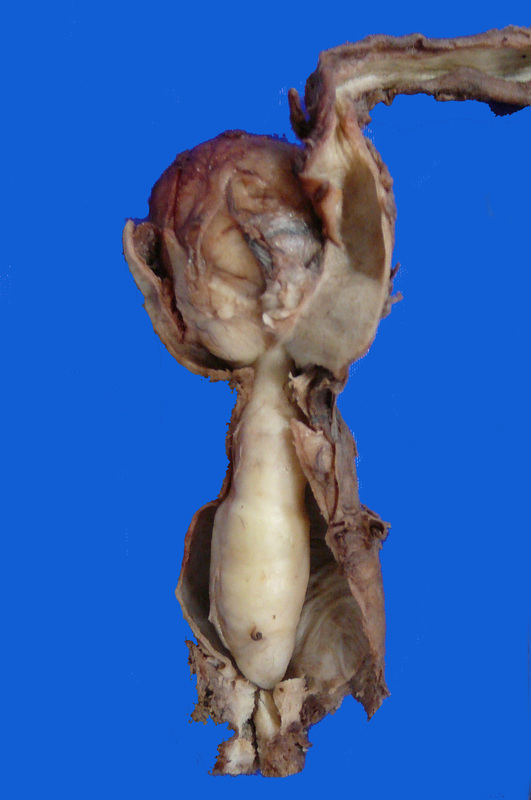 Ureterocele with leiomyoma of the ureter. Br J Urol 1980; 52:400. Naruse K, Yamada Y, Aoki S, Taki T, Honda N, Iwafuchi H. A case of primary leiomyoma of the ureter. Int J Urol 2007; 14:248-250.